Copper Bezel wrote: What does it mean to go to tilt? I think I want that in my idiom. Odds are it is just me using it wrong, but to me TILT was always a direct reference to cartoons like Bugs Bunny when something, like an altimeter is going fast, like REALLY 'you-cant-see-the-numbers-passing-by' fast and then the meter reads TILT out of a sudden like it was saying 'I quit'. So when I say my math calculators went TILT they gave up on such a problem as the one I mentioned above. Case in point, I still have the 'result' saved, I am not too well versed in physics so I cannot even read it correctly. *little edit here, just googled 'tilt' to check if maybe I had it wrong. Turns Google is trolling me. Dammit, I am too tired for this. My guess is that tilt is in reference to pinball machines where if you set off the mechanism inside it designed to detect... tilting the machine... The machine locks up penalizing you with the loss of the ball in play. His usage would be an overflow likely with a primitive calculator that can't deal with large numbers and a lack of converting to bigger units. Edit: From what I recall, calculators that have an issue typically display ERR or ERROR. Also, as an aside, I think the aqua-mars model would be more interesting as we are less familiar with it, rather than being less interesting. Copper Bezel wrote: There's not a lot of atmosphere for cooling, but there's still conduction into the regolith. I come to regret that I have no clue about thermodynamics - the average temperature of the Mars surface is a bit low (-133°C), but the pressure is very low, too (6 mBar). Anyone able and caring for an answer on what would happen with the water, once it arrives at Mars? Since it is not just pure H2O but - at least at departure on Earth - carrying a lot of soluted gases, organisms, whale-goo and -gibberish. Would that be enough to gift Mars with a bit of an atmosphere? As a Californian, one thing about this image jumps out to me immediately: you seem to have merged the Pacific and North American plates. Where is the San Andreas fault? My calculator does not say TILT perse. It says either 'Syntax Error' when the equation is incorrectly stated like (3+2 It lacks the closing parenthesis. Or 'Math Error' when the number overflows, but I did not use my calculator, but online flow calculators, but most asked for certain parameters I did not have. I use the TILT as a generalization of when a machine outright stops caring, similar to the BSoD but less in your face. This is brilliant, I can now say that I'm hypothetically a citizen of the biggest country in the world! If we placed the portal at the correct height, would we be able to heat Mars to a comfortable temperature with the impact heat and the friction heat from the water hitting the atmosphere? I kinda wanna know soon, because I already ordered the portal and they need to know the target altitude. Would anyone ever find this text by the way? In the OTT it would be found, but this is not the OTT. Maybe someone finds it when quoting. Neil_Boekend wrote: I kinda wanna know soon, because I already ordered the portal and they need to know the target altitude. Would anyone ever find this text by the way? In the OTT it would be found, but this is not the OTT. Maybe someone finds it when quoting. But of course the real question is: Can we drain the water all the way down do R'yleh? t's pretty similar, but there are a few small changes. Sri Lanka, New Guinea, Great Britain, Java, and Borneo are now connected to their neighbors. As is Denmark, so now the Swedes and the Norse can walk down and buy our beer. But I for one welcome our new Dutch overlords. Weed will be free and legal all over the world, and Danish is similar enough to Dutch that we could easily adapt to the New World Order. Plus they're a monarchy like ours. Netherlands, if you don't put this plan into effect, we will! Last edited by Olaf Klischat on Fri Jul 12, 2013 12:52 am UTC, edited 1 time in total. What effect would continental drift have on this map, I wonder? Conversely, what effect would the absence of deep oceans have upon continental drift? It's easy to find world maps predicting 10^7 million years, but not so much in the 10^5 range. Um, what if this article had images? -- I can't finish loading the Drain page on my computer, so I don't know if this was noted or not. If the portal instead opened on the surface of Venus, what direction would the flow occur in? gmalivuk wrote: It... gets covered with water? Most people aren't terribly familiar with the topography of Mars as it is, so I think a similar set of maps for it wouldn't be as interesting. What about other stuff? Would the whales fit through the portal too? Would new life start to grow on Mars? Would it be too cold for anything there to live? Would the weight of the water rip the planet apart? If the portal is facing away from the surface of Mars, does it have enough gravity to pull the water back to the surface, or would the water blast off into space? gmalivuk wrote: Yeah, evidently the center of mass doesn't coincide with the center of a uniform body with the same surface. Doesn't that mean that a lot of the mountaintops will flood too (maybe even olympus mons)? If the water level is higher in the south, spread similar to the rock. Mons Olympus stands at over 20 kilometers over the datum (Mean level of Mars height, basically its 'sealevel') so even with all the water of Earth, I doubt we can cover it. Same with the prince mounts, which while smaller are still massive compared to even the Everest. Though I would bet most of the surface would indeed flood completely, leaving Mars as a water world. As a side note, for the person that asked about why the northern hemisphere is lower, it is believed something the size of Pluto crashed with Mars' northern half and destroyed it, leaving a crater half planet wide. I recall reading how if you take out the Tharsis bulge and the Elysium one, which can be attributed to the volcanic activity post impact, you do get a rather circular crater. (Also, notice how Mars hemispheres are so different as a result, the southern one being rugged and old, possibly even more rugged due to impact debris, while the northern side is relatively flat and smooth in comparison, and is quite young in contrast). How can a planet be off center? Rock behaves like water in geological scales, it would eventually settle under its own uneven gravity. Thanks for the explanation, guys! That's really intriguing. I hadn't heard the term "Martian dichotomy" before, but it also has a Wikipedia page. Although the page doesn't explain the center of gravity thing directly, the impact hypothesis does when combined with the assumption of a denser core and a less dense crust. And yeah, it really looks like all the white bits on Josephine's map should definitely be above water, plus possibly the brown bits, and nothing else. Very stupid correction, but the Grand Banks are off Newfoundland, not Nova Scotia. Yay, New Zealand was mentioned! on a slightly more serious note, I think some parts of the ocean that would be separated by ridges would end up emptying more than expected due to erosion. Once the sea level gets low enough, there will only be a few places low enough for the water to flow through, so the water will be flowing fairly quickly, and probably eroding away the bottom of the gap to make it bigger. On the other hand, removing several km of water would result in fairly substantial continental rebound, and probably a lot of unexpected earthquakes and volcanoes! You think thats a big impact? Pfft, Mars might have been hit by a Pluto sized planetesimal, but Earth got hit by a Mars sized one! 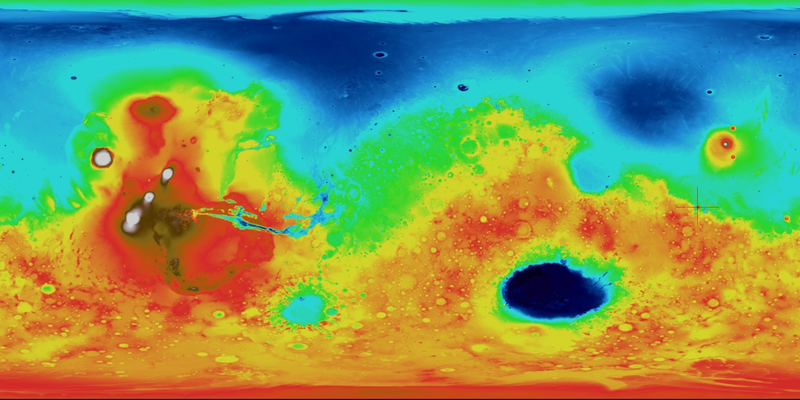 Also check the Mars map they linked, for those unaware, the giant blue eye in the south is the Hellas Basin, another giant impact that created the biggest hole in all Mars, even deeper than the Borealis Planitia of the north (the big lowlands that would make a nice ocean for Mars). And there is no gravity offset, planets are all based on their core's position, everything else just sort of float on top, and the big impact was billions of years ago, even if it could have pushed the mantle and crust off-center, it would have returned to normal by now. Planets cannot be anything but spherical (safe for small bulges on the equator due to rotation) gravity forbids this once they pass the threshold of going from irregular rocks to planets. I was seriously thinking of asking almost this exact question, but in a different sense: what if you opened the exit portal in on the ground pointed UPWARDS? Like say you put it on the National Mall in Washington DC? How high would the geyser be, and how long would it take to flood the city/eastern seaboard? Or, because of the massive pressure, and thus, height involved, would the water reach so far into the sky as to cause more global atmospheric effects than local flooding (would the water affect cloud formation, for example)? The water is moving at about Mach 1.3 at the exit, and I have NO idea what supersonic speed means for a jet of water, especially one this big. It's worth noting, though, that industrial water jet cutters can shoot water out at Mach 3, so, it's obviously been well studied. Just not by me, hehe. Minus air resistance and hypersonic effects, not to mention the weight of the water at the top of the geyser already beginning the return to earth(which would ALL absolutely be HUGE mitigators here, so this is just adding to the hypotheticals), a drop of water would reach about 10 km into the sky in 45 seconds before coming back down in the same amount of time. I used an online trajectory calculator to figure that part out. I still don't get how an entire planet can be off-centre. The centre is not some fixed point in space. It's the centre-of-mass. If I move all the mass in a planet 1 meter to the right, than the centre-of-mass also shifts 1 meter to the right. There's no escaping that. I mean earth has an uneven distribution of continents as well. Most of the land is on the northern part, and so the average elevation of the northern part is higher. But this is compensated by the fact that land-plates are thicker than ocean-plates. And since plates are less dense than the mantle, this averages out. Think of icebergs floating in water. A big iceberg sticks out higher above the water, but the average density doesn't change, since it also sticks further below the water. Mars however has no tectonic plates, as far as I know. So this explanation doesn't seem to apply to Mars. The way I understand it, Mars is still recovering from the impact and in time, it will be even again. It may take a while though. It would actually take hundreds of thousands of years for the ocean to drain. Umm ... what am I missing? A rate of 1cm/day should only take 275 years to drop 1km. Should it be a thousand years (hundreds of thousands of days)? Should I rush home and fill the bathtub, this instant? That 1 cm/day mark is probably off by some orders of magnitude, if you just consider the momentum change imparted on the water by the pressure (that's probably a very rough estimate, but certainly not off by more than 100% or so), and solve for the flow speed of the water, that's p*A=v*dm/dt=v*density*A*ds/dt=density*A*v^2 <=> v=sqrt(p/density)=331m/s. And that corresponds to a mass flow rate of ~104,000 tons/sec, and a volume flow rate of ~104,000 m^3/sec. With an ocean surface area of ~3.6e14m^2, this would mean a sea level sink rate of about one centimeter per year, not per day...? Diadem wrote: I still don't get how an entire planet can be off-centre. The centre is not some fixed point in space. It's the centre-of-mass. If I move all the mass in a planet 1 meter to the right, than the centre-of-mass also shifts 1 meter to the right. There's no escaping that. If you have a hemisphere, then the centre of curvature is on the flat surface, the centre of mass is 3/8 of the way through along the axis of symmetry, and the sharp edge is the highest point, while the centre of the flat surface is the lowest. You can have several possible definitions of centre, and, unless an object is spherically symmetric, you can't guarantee them being the same point. By center what you define then? I see it as the point where something would fall to if it could pass through solid ground. Meaning the center of mass. Sure, the northern side of Mars is lower due to the impact, but that is just by a few kilometers, that's peanuts to a planet, it is still quite on center, mass wise, and visually. That is unrelated to tectonics. Rock flows like water when seen in geological times, even if you tried, you would be unable to get an ovoid shaped planet, unless maybe if some massive force kept applying force to it so it stayed stretched. Supposedly the draining takes hundreds of thousands of years, right? But the example says "oceans would fall by less than one centimeter" at the start. Let's assume the probable extrema: Randall probably would have said "millimeter" if it was off by more than 10x. So I'll assume 1 mm as the slowest drain at the start. Since the oceans are wider at the top, drain should generally increase as it goes down, but I'll assume it's constant just to be extra-super-conservative in the estimation. One millimeter per day is a bit over 1 meter per 3 years. Five kilometers is 15,000 years, at most. And if we assume 0.5 cm to start, 1 cm avg. still seems conservative to me for the duration, in which case it's 1,500 years. 1,500 years (or even 15,000) is not hundreds of thousands of years. To be hundreds of thousands of years, the order of change would need to be on the micrometer level (or maybe smaller), not the centimeter level. What the hell...? Challenger Deep is 10.8 km deep, not 5. EDIT: duh, you were looking at average depth. In that case, carry on. runetrantor wrote: By center what you define then? I see it as the point where something would fall to if it could pass through solid ground. Meaning the center of mass. And the point is that the center of mass need not correspond with the center of the outermost part of the surface. 1) The center of mass isn't necessarily where a test particle would end up if the mass distribution is sufficiently irregular. 2) Elevation isn't measured in distance to the center (for any definition of center), but instead relative to a surface of equipotential in the planet's gravitational field. On Earth, the surface in question is the one that corresponds to mean sea level in the open ocean, while the choice is actually somewhat arbitrary in Mars's case. I suppose the most reasonable choice would be the one that makes the mean elevation relative to it exactly 0, but I'm not sure that's the case. Yes, Mars does have a 'sealevel' if you will, the datum, which is precisely that, the mean height elevation, of course, this is altered by Hellas Basin and Olympus, so it is not that accurate. And sure, the crust is never perfectly round, but gravity is, if we shaped a planet to be square (lets assume we can keep it like that somehow) gravity would still act as a sphere of influence, in this case you would be walking on a slope forever. What do you mean? Because the equipotential surfaces are most assuredly not spherical. Which means that the force of gravity most assuredly does not always point to the center of mass. eran_rathan wrote: Challenger Deep is 10.8 km deep, not 5. Yes, but it only takes 5 for the world to change almost-all-the-way. Most of the work is done there--the last half of the step will take a tiny proportion of the same time to complete. If you like, use the most conservative estimate and then *2. 30,000 is still not "hundreds of thousands". Either Randall greatly overstated how fast sea level drops, or he miscalculated the rate of flow per ocean volume, or there is an assumption I'm making that I'm not seeing. Either way, it doesn't add up. gmalivuk wrote: What do you mean? Because the equipotential surfaces are most assuredly not spherical. Which means that the force of gravity most assuredly does not always point to the center of mass. Imagine a metal cylinder the size of the Earth. Now stretch one end to infinity. Choose a point several AU away from the finite end of the cylinder. If gravity always went to center of mass, it would go toward the horizon; but common sense says it goes to the axis. This is because gravity drops with the SQUARE of the distance, not the linear distance. So the further away some part of the mass is, the less it affects you. Trickster wrote: Either way, it doesn't add up. Yes, as calculated a couple other times already, it would start out at 1.27cm per year rather than per day.